U.S. Secretary of Defense Jim Mattis. 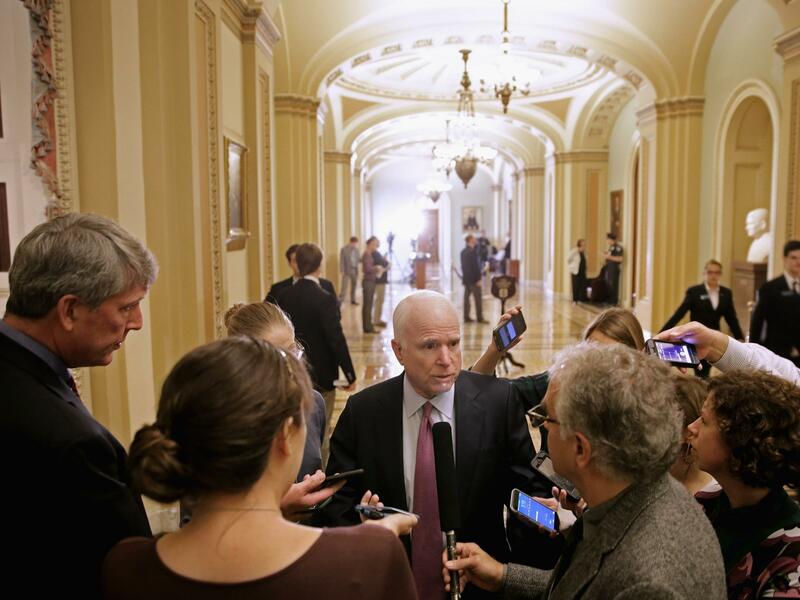 Senate Armed Services Committee Chairman John McCain, R-Ariz., talks with reporters after the National Defense Authorization Act passed 93-1 at the U.S. Capitol in 2015. 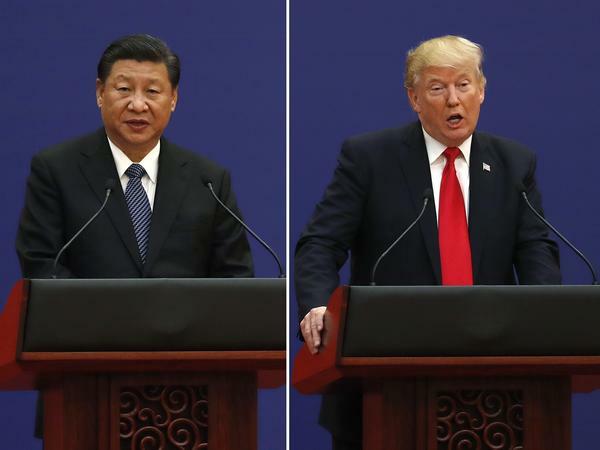 U.S. President Donald Trump, right, and Chinese President Xi Jinping speak during a business event at the Great Hall of the People in Beijing November 2017. President Trump meets President Putin of Russia in Helsinki in July. U.S. Defense Secretary Jim Mattis, left, at the Demilitarized Zone in the border village of Panmunjom in Paju, South Korea in October 2017. It may seem counter-intuitive and head-scratchingly odd, but Congress nearly always approves defense spending bills before the armed services committees — which actually oversee the Pentagon — vote on how the money will be spent. The John S. McCain National Defense Authorization Act for Fiscal Year 2019 was enacted this month well ahead of a still-pending budget bill. It was also the earliest date on the legislative calendar that the NDAA has been sent to a president for his signature in more than two decades. The bill sped through Congress as the nation's military continues waging war in Afghanistan, Syria, Yemen, Iraq, Niger, Libya, Somalia and an untold number of other global hot spots. 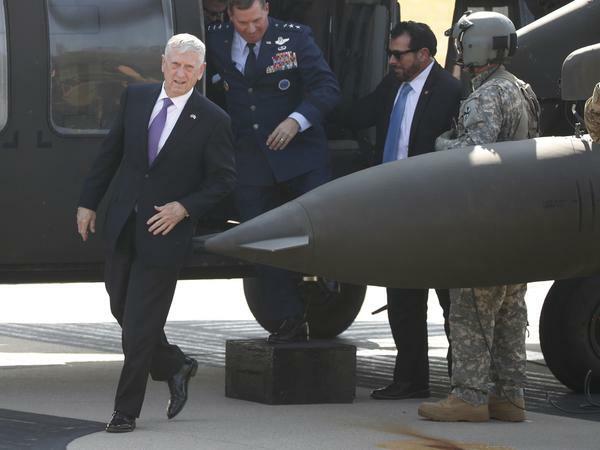 All arise from what's been the Pentagon's main post-Sept. 11 focus: fighting terrorism. But this new NDAA reflects Defense Secretary Jim Mattis' pivot away from those prolonged and inconclusive battles with insurgencies, to what he says should be the Pentagon's main concern: the United States' growing competition with the world's two other great powers, Russia and China. Big majorities in the House and Senate approved the NDAA. Among the 10 senators who opposed its final passage were three Democrats — Kamala Harris of California, Elizabeth Warren of Massachusetts and Kirsten Gillibrand of New York — who are all considered potential contenders in the 2020 presidential race. Congress matched dollar-for-dollar what the Pentagon asked for. Yet, the NDAA mandates doing more with less. It calls for adding 15,600 troops to the country's 1. 3 million active duty forces, an expansion also sought by the Pentagon. It adds another aircraft carrier and two littoral combat ships that the Pentagon did not request. A total of 13 new ships for the U.S. Navy are authorized — exactly half as many new ships as Russia plans to build this year. The Republican-controlled armed service committees backtracked and bowed to several significant policy changes the Trump administration sought during the merging of the House and Senate versions of the NDAA. Mattis convinced Congress to strip the Senate's tough talk on Turkey from the final version of the bill. That version instructed him to draw up plans for suspending delivery of 100 F-35 Joint Strike Fighters ordered by Turkey as well as Turkey's participation in an international consortium producing the radar-evading warplane. It was retaliation for the Turkish government's arrest and detention, following a failed coup attempt two years ago, of Andrew Brunson, an American Presbyterian minister; as well as this longtime NATO ally's intention to buy the Russian-made S-400 missile defense system. Mattis wrote Congress in July asking that Turkey's access to the F-35s not be blocked. In its place is language from the House bill, which simply requires that Mattis submit a report "on the status of the United States relationship with the Republic of Turkey" by Oct. 31. The White House prevailed in its quest to exclude from the NDAA language approved by the full Senate blocking the sale of American technology to Chinese telecommunications giant ZTE. Such a trade restriction had already been imposed by the Trump administration, but it was lifted after Trump spoke with Chinese President Xi Jinping and tweeted that he was looking for a way to get ZTE back in business because "[t]oo many jobs in China [were] lost." The final NDAA does nothing specific to restrict the sale of American technology to ZTE and Huawei, another Chinese telecommunications and video surveillance giant. But it does tighten overall U.S. national security reviews of American exports of sensitive technology by issuing stricter guidelines for the Committee on Foreign Investment in the U.S., or CFIUS. The NDAA also bars the purchase or use by the federal government and its contractors of technology sold by ZTE and Huawei. That restriction would not, however, apply for sales to the general public. There is also a ban in the bill on Pentagon spending for any Chinese language instruction provided by the Confucius Institute, which is operated by an entity associated with China's education ministry. Mattis also prevailed in dissuading Congress from requiring enforcement of a 2017 sanctions law for countries that purchase Russian-made weapon systems or parts. 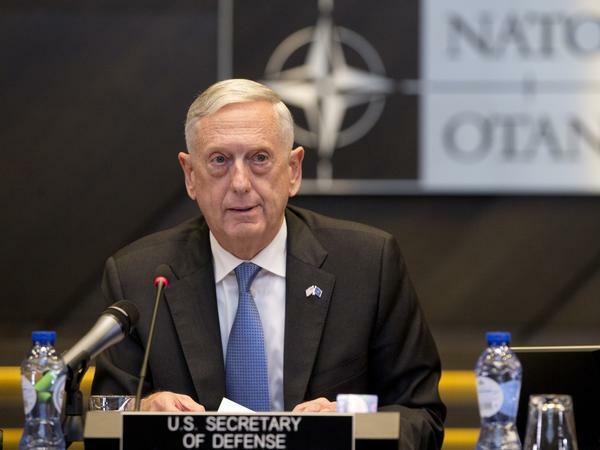 "Some nations who now actively seek a security relationship with the United States still rely on Russia for spare parts and other material," Mattis wrote, citing India and Vietnam as examples. — $6.3 billion for the European Deterrence Initiative, the largest U.S. infusion yet for this effort — started during the Obama administration — that's aimed at bolstering defenses in European nations near Russia. — A requirement that Secretary Mattis send Congress by March 2019 a feasibility report on permanently stationing in Poland U.S. Army brigade combat teams that are currently cycling through nine-month rotations there. Russia maintains that the 1997 NATO-Russia Founding Act prohibits the establishment of permanent NATO bases in former Warsaw Pact nations, including Poland. NATO and the U.S. disagree, but have nonetheless held off establishing new bases in those countries during the 21 years since the act was signed. — A directive that Treasury Secretary Steven Mnuchin brief Congress on all assets known to be held by Russian President Vladimir Putin, his "oligarch" associates and other high officials in Russia. — A strengthening of a ban on funding anything that recognizes the sovereignty of Russia over Crimea. — A labeling of Russia as a violator of the Chemical Weapons Convention, based on Russia's alleged role in chemical attacks in Syria and Kremlin-linked assassination attempts in the United Kingdom. — A requirement for certification that Trump has imposed sanctions on Russia for violations of the Intermediate-Range Nuclear Forces Treaty, as he had been directed to do in the 2018 NDAA; the bill also calls for the administration to submit plans to Congress for additional sanctions. 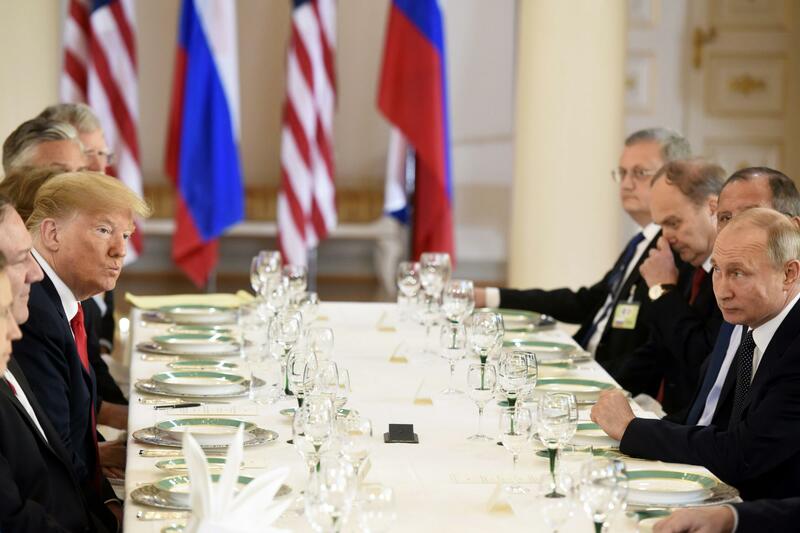 A House provision was dropped that had called for considering INF treaty obligations nonbinding if Russia is not in compliance with the treaty. — A ban on extending the New START nuclear arms limitation treaty (which expires in Feb. 2021) unless Congress receives a report from the administration on Russia's new strategic weapons determining whether Russia is in compliance with the treaty. — Authorizes $65 million "for developing and producing a low-yield warhead to be mounted on a submarine-launched ballistic missile," according to a summary of the bill. Proponents say this would deter Russia from using tactical, lower-yield weapons; opponents say such weapons increase the likelihood of nuclear war. — Prohibits funds being spent on in-flight refueling of Saudi aircraft or members of the Saudi-led coalition conducting missions over Yemen, until the U.S. secretary of state certifies that Saudi Arabia and the United Arab Emirates are seeking a diplomatic resolution of the conflict in Yemen and respecting the humanitarian needs of that country's inhabitants. — Requires that the Trump administration brief Congress on what the U.S. strategy is in Yemen. — Bars funding for the reduction of U.S. troops stationed in South Korea below 22,000, unless the secretary of defense certifies such a draw-down is in the national security interest of the U.S., and both South Korea and Japan have been "appropriately consulted." — Renews the Syria train-and-equip program, but limits any expenditure of funds until Trump submits to Congress the Syria strategy report mandated by the 2018 NDAA. — Extends the Afghanistan Security Forces Fund through the end of next year. This continues the effort to stand up the Afghan military and police forces, which has become the main focus of the U.S. in Afghanistan. — Authorizes $25 million to promote recruitment, training and integration of women in the Afghan National Defense and Security Forces. — Requires that the secretary of defense designate a senior civilian official focused on civilian casualties associated with U.S. military operations. That official would regularly inform Congress on civilian casualties and work to improve reporting on noncombatant casualties. — Renews congressional bans on transferring any of the 40 remaining detainees to U.S. prisons and on building facilities in the U.S. to hold them. — Denies the $69 million requested by the Trump administration for building a new "high-value detainee complex." That would replace a top-secret structure there known as Camp Seven which currently holds 15 detainees. — Establishes a U.S. Space Command as part of the U.S. Strategic Command, but does not authorize funds for creating the space force that Trump has directed the Pentagon to create.